Caustic, despite his premium status as one of just three characters in Apex Legends who must be unlocked through Legend Tokens or Apex Coins, was always one of the most underperforming Legends in the game thanks to his bulky hitbox. But now with the release of the 1.1.1 update, Caustic is much tankier and deadlier than he ever used to be, and there’s no better time to start learning how to play as him. Our Apex Legends Caustic guide is packed with tonnes of practical tips and strategies relating to each of his abilities, and much more. We’ve got a fair amount to cover with this Caustic guide, despite his abilities all seemingly revolving around the same principle. To skip to a particular section of your choice, simply click on any of the below links. Caustic excels in close-quarter situations. His abilities all centre around his patented Nox Gas, which slows, blinds, and damages enemies caught inside it, and reveals their locations to Caustic through the smog. So he’ll always be at his best in confined spaces; underground areas, indoors, or in the final circles. Out in the open, his abilities are far less effective unless you adopt a very aggressive playstyle when encountering enemy teams. There are several downsides to playing as Caustic compared to the other Legends. For example, he doesn’t have a dedicated method of escape, or any way to increase his movement speed. Instead, his abilities all focus on slowing down your enemies – but your Gas will also slow your teammates down, so you’ll need to make sure you’re with a team who knows how to fight alongside a Caustic. But on the other hand, these abilities also allow Caustic to play much more independently, engaging multiple enemies at once, backed up by the protection provided by your Nox Gas Traps and Nox Vision. We’d known for quite some time that Caustic needed buffing, even after the arrival of Season 1 and the associated reduced hitbox that better fit his character model. Both the radius and proximity radius of his Nox Gas Traps were increased, and there is now no delay between a trap being set off and enemies being damaged by it, but Caustic was still nothing like as viable a Legend as others such as Wraith and Octane. But with the release of v1.1.1, Caustic now enjoys some very significant buffs to his abilities and his survivability. The new “Fortified” Passive, added to both Gibraltar and Caustic, reduces all incoming damage by 10%; and Caustic’s Gas damage per tick has been increased from 1 to 4 – a huge buff to the damage of his Nox Gas which makes him much more dangerous than he ever used to be. 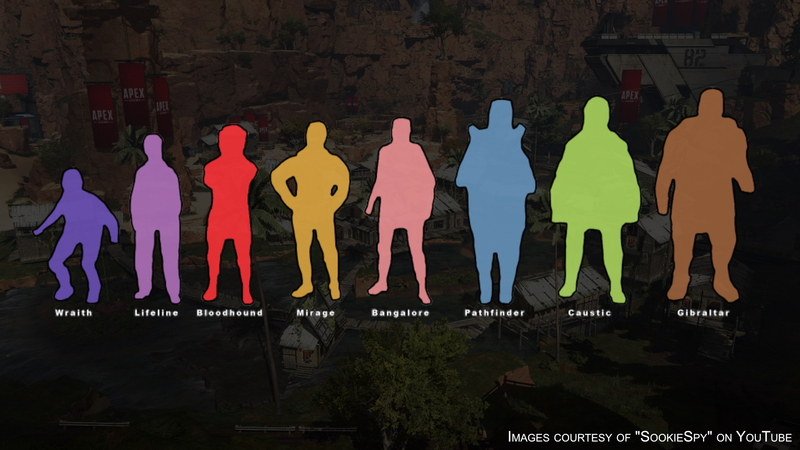 Read all about these and all previous changes over on our Apex Legends update page). The above is a composite of various hitbox images created by YouTuber “SookieSpy”, which bring to light the incredible discrepancies in character hitboxes in Apex Legends. Season 1 brought with it some changes to the hitboxes of Gibraltar, Caustic, and Pathfinder to better fit their character models, but the fact remains that Gibraltar is about twice the size of Wraith, and thus, twice as easy to hit. As you can see, Caustic occupies a less-than-ideal position in this chart, second only to the massive hulking Gibraltar in terms of hitbox size. This means he’s pretty damn easy to hit, particularly compared to the tiny figures of Wraith and Lifeline. But thanks to his new “Fortified” Passive, added in the 1.1.1 patch notes (read more with our Apex Legends update guide), Caustic now also enjoys a 10% damage reduction from all sources, making him the second tankiest Legend behind the Gun-Shield-touting Gibraltar. Just like every other character in Apex Legends, Caustic comes equipped with a Passive (always-on) ability, a Tactical (activatable on short cooldown) ability, and an Ultimate (activatable and requires charging over time) ability. However, unlike any other Legend, Caustic’s powers all revolve around exactly the same tool: his unique Nox Gas, which damages enemies those caught inside, as well as obscuring the vision and preventing the sprinting of anyone within (except for you). Let’s take a look at how each of his abilities interact with this mechanic. Nox Vision Allows you to see enemies through your gas. Fortified Reduces incoming damage by 10%. Fortified is here! It was talked about for a long time up to this point as a possible method of making big chunky Caustic and Gibraltar more viable, and Respawn have seen fit to add the flat 10% damage reduction with the 1.1.1 patch notes. I won’t spend time talking about it, because there’s not much to talk about here. But it’s good. Caustic and Gibraltar really do feel more tanky than the other characters now, and it’s a much-needed change. Nox Vision is what allows Caustic to be so deadly inside his own Nox Gas. Aside from being immune to the damage and other effects of the gas, Nox Vision lights up any enemies that are currently being damaged by your Nox Gas. It’s one of just two Tactical abilities that highlight enemies the way a Digital Threat sight does, the other being Bloodhound‘s; but while Bloodhound’s has the advantage of seeing enemies through walls, Caustic’s Nox Vision is dynamic, tracking enemies at every moment that they are inside the gas, rather than just highlighting where they were at a specific time. Your Passive basically serves as another reason to rely heavily on your abilities to spread Nox Gas across every encounter, and then pick off enemies while they are damaged and vulnerable. It also makes for what some might consider to be an even more effective method of defence than Bangalore’s Smoke, simply because when you surround yourself with Nox Gas you’ll immediately see when an enemy is attempting to make their way through it to get to you. Nox Vision’s highlighting effect only works while the enemies are in the Gas and taking damage; the moment they move outside the gas, the highlighting disappears. In many ways this works much like a Digital Threat sight attachment would, so if you find a Digital Threat sight, it’s probably better suited for someone else on your team. You don’t need to be aiming down sights in order for the highlighting to take effect on enemies. Nox Gas Trap 12.5s Starts at 4, +1 per tick, Max 10 25s Drop canisters that release deadly Nox gas when shot or triggered by enemies. Caustic’s Nox Gas Traps are what you really think of when you think of what Caustic brings to the team. These large canisters can be dropped a (very) short distance in front of you, and can be activated after a moment either by proximity (i.e. if an enemy is close enough to it) or by being shot, either by you, a teammate, or an enemy. Once activated, these traps will spray out a cloud of toxic Nox Gas around it, which is now deadlier than ever thanks to the 1.1.1 update. Like Bangalore’s Smokes, this is an ability with multiple charges. In Caustic’s case, you can have a maximum of three charges for this ability (so three traps that you can lay down in quick succession), but these traps if left idle will persist until the end of the match, and you can actually have a maximum of six of these traps on the map at any given time. If you attempt to place a seventh, then your oldest trap will be removed from play, and so on. These traps are to be used both defensively, to deter enemies from getting closer and to cover yourself in Nox Gas, and offensively, to pressure enemies hidden around corners and behind cover. It’s a very good idea to shoot your traps shortly after throwing them, rather than relying on enemies to stumble too close. The reason for this is that it’s fairly well-known now that you can shoot the bottom cylindrical red section of the trap in order to destroy it without setting off the Nox Gas. The main part of the Nox Gas Trap is bullet-proof, and can therefore be used as (somewhat effective) cover in certain situations. However, you can shoot the bottom red section of the trap to destroy it entirely. These Traps are the only significant form of non-weapon damage available to any character at the beginning of the game, so take advantage of it early on when dropping in popular and confined areas such as the Supply Ship. The damage inflicted upon enemies increases the longer they stay in the Gas. You can use these Traps to block doors from opening – though many opponents will have the wherewithal to kick or blow open the door instead. It’s a good idea to place down and shoot one or two of these Traps when you want to heal up or revive a teammate, to obscure yourself and act as a deterrent. You should attempt to place these traps so they are not immediately visible, or enemies will just shoot the bottoms of them to destroy them. Place them around corners, in bushes, etc. The “detection range” of the canisters (beyond which an enemy would trigger the Trap) is half that of the actual Gas radius, so enemies will be caught in the middle of the Gas if they activate it. Nox Gas Grenade Starts at 4, +1 per tick, Max 10 20s 2m Blankets a large area in Nox gas. Caustic’s Ultimate is frankly a little underwhelming, and has no right to have the charge time that it does. It doesn’t even have the right to be an Ultimate, really, as it’s more or less the same as placing down and shooting two or three of his Nox Gas Traps. But still, it has some utility that his Tactical lacks. Nox Gas Grenade is exactly as you’d expect from the name; you throw a grenade, and it explodes on impact into a large cloud of Nox Gas, about twice the diameter of a regular Nox Gas Trap. And that’s it, really. It’s useful in that you don’t have to bother with throwing and then shooting in order for it to activate, and it can be used to great effect to obscure yourself when you need to heal or revive a teammate; and there is some use in being able to throw it further than a normal Trap. But chances to use this ability offensively are very few and far between, as they rely on an enemy team that doesn’t react quickly to the Gas. You might get a few ticks of damage in, but that’ll be it: which is why I’d advise you keep hold of your Ultimate until you need to use it as a deterrent. Think of it as one of Bangalore’s Smoke Grenades – look for opportunities to block an area off, or to obscure yourself or a teammate from the enemy as you reposition or heal. Caustic’s Nox Gas Grenade damage does not stack atop the Nox Gas Trap damage. This Ultimate ability is best used in all the same ways as a regular Nox Gas Trap, but it’s slow to charge, so don’t rely on it during fights as you won’t always have access to it. One excellent aggressive use for the Nox Gas Grenade is if you are up against a team with a Bangalore, and they’re hiding within Smokes. Throw your Gas Grenade in the Smoke, and it’ll cause chaos inside the clouds of fog and smog, flushing them out into the open. Finally, let’s finish up with some more general tips and tricks on winning Apex Legends matches as Caustic. Be aggressive. Caustic is most vulnerable out in the open, so you need to close distances as quickly as possible. Go for flanks, find ways to turn the encounter into a close-quarters one where you can make good use of your abilities. Learn where you are most powerful: indoors, underground, in the final Rings. Always look for opportunities to use your Nox Gas well. Look for confined spaces throughout the match, and gravitate towards them. This should also affect where you land; places like Skull Town and Slum Lakes are ideal. For more information on all the different locations across King’s Canyon, check out our detailed Apex Legends map and locations guide. Use your Nox Gas as a deterrent when you need to. Caustic’s Gas is something that incites fear in the enemy. It’s always a scary thing to find yourself face to face with a Nox Gas Trap. Use this to your advantage, creating blockades and “hostile” zones between you and the enemy team when you need time to reposition or heal. This is also useful when you are being third-partied; use your Nox Gas to slow the progress of one team as you engage the other, or retreat to a safer location. And that’s everything we’ve got for now on Caustic. He’s a tricky Legend to master, for sure, but I’ve seen some truly skilled Caustics before, and believe me, they can really ruin your day. There’s no better time to start learning this buff-as-a-truck character, so why not take the plunge into the Nox Gas, and find out all his strengths for yourself?